This Luxurious Lake Summit home is located right on the water in Tuxedo, North Carolina. Just steps from a 2 slip boathouse with a jump off platform on top. There is a large screened porch and wrap around deck, also a deck near the lake with an outdoor fireplace. The house has 4 bedrooms and loft with a sofa bed. There is a master bedroom on the main floor with a fireplace and a king size bed with a great bathroom with a claw foot tub and walk-in shower. Also on the main floor there is a small bedroom with twin beds perfect for kids. The top floor boasts 2 bedrooms; one with a queen bed and a private bathroom; the other has a queen bed and 1 set of bunk beds. The bath is across the hall. There is also a loft with a sofa bed. There is a separate guest house with a king size bed with a private bath. The guest house has its own screened porch. The only house on the Lake that is located directly on the water for rent. Outdoor fireplace. MasterCraft Boat Available to rent from third party. Please contact for details! Great house w/screened porch and outdoor area w/fireplace for the evenings. Easy access to Flat Rock, Hendersonville, and Asheville. This is a high-end property, spacious, beautifully decorated and appointed. It's location is excellent, one-hour from Spartanburg/Greenville. It is a short drive to Hendersonville, Flat Rock and Saluda which have great restaurants, arts and craft shops, farmers markets. other nearby attractions include hiking and kayaking. The lake is small but completely private and was not super busy. The property had a boathouse with a large dock suitable to sunbathe or fish from. There is also a option to rent a ski boat. There were kayaks, fishing poles, and plenty of life vests so we did not need to take much with us. Our family had a wonderful time. The owners are gracious and helpful! This house has all the amenities anyone could want. The owners are nearby and helpful. The pictures of the interior don't do it justice - it is beautiful and comfortable. The dock and boathouse are down the lawn from the house, instead of across the street from the house. There are gathering places for the entire family and quiet places to be alone. Cooking s'more after dinner in the outdoor fireplace was an evening treat for the kids and adults. The lake is beautiful and there are kayaks available to use. If you want to leave the property, there are opportunities for sightseenig and adventure nearby. I would recommend this house to anyone. We can't wait to go back! Best house on the lake! We have spend the last 4 summers at this wonderful house and we hope to return for many more. The house is charming and very well appointed with all the amenties you could want. The screened in porch overlooking the lake is where you will spend all your time! 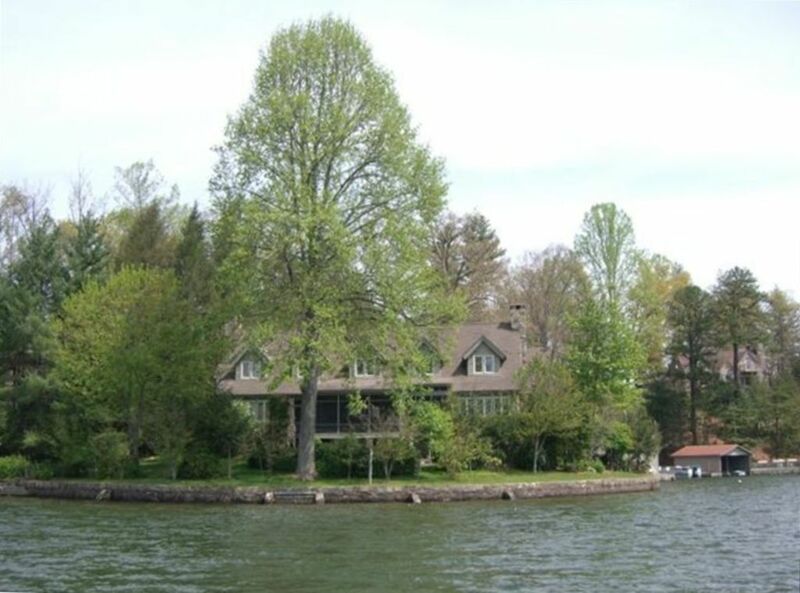 The whole house is very comfortable and is located on a secluded point that is located right on the lake. No steps to deal with! This is one of the most relaxing places and athe views are incredible. Highly recommend this fabulous house! Located just 25 minutes via I-26 from the Tryon International Equestrian Center featuring horse shows, dining and shopping for the family.